There's a new restaurant in town and they're bringing us some great treats from all over the country and what we loved most is that the food at Autobahn comes to you on a conveyor belt. This is the first time ever we've seen such a unique concept and were itching to drop by. 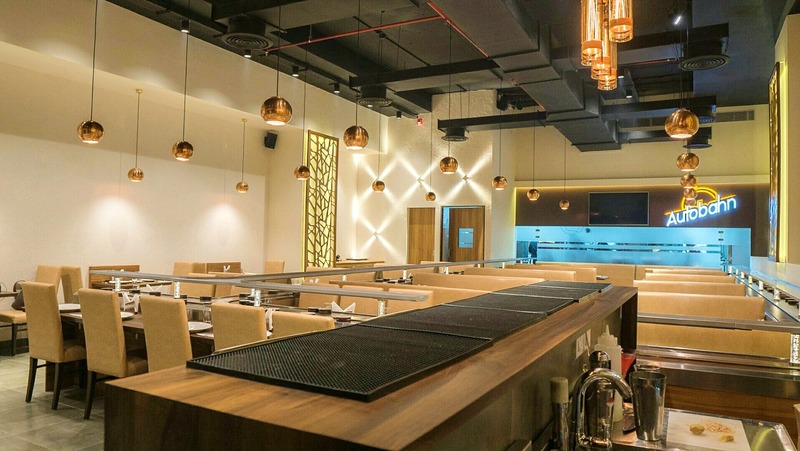 Their virtual buffet ensures that every table has access to the conveyor belt that displays food items like basic starters, chaat and desserts. There are five kinds of bowls on the belt with a price on each, ranging between INR 80 and INR 150. On the other hand, for those that like controlling what they can get to their table with ala carte, there is a tab that can be used to send orders directly to the kitchen. The food then comes to your table on a cart! We recommend you order the bhetki maach, hariyali mushroom tikka, paneer pasinda, nimbu nariyal murg and shahi tukda. Sounds all too mechanised? Don't fret! They do have people around to help you if needed and you could also leave your feedback with them.